The 49.3 metre superyacht Volpini has finished an extensive refit at her original builder Amels shipyard in The Netherlands. The refit work included a full repaint, machinery and electronics upgrades, and a full interior rejuvenation. 'The owner wanted it to look exactly as it looked ten years ago when it was brought out,' says Volpini's Captain Nathan McFadyen. The original cabinetmaker, Metrica, was called in for the interior refit. Volpini's refit was completed on time and on budget. 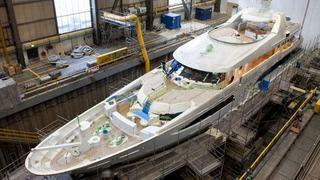 Now after her refit, Volpini is back on the water and cruising Mediterranean this summer.